RTX 2080 Ti and GTX 1080 Ti are the two most powerful gaming graphics cards, and also the top of the line cards in their respective series. RTX 2080 Ti is the top-end card in the latest RTX 20 series while GTX 1080 Ti is in the GTX 10 series. Both of these graphics cards are capable of running latest AAA games at 4K resolution with good frame rates. Also, these cards can also be used as a workstation card too especially the RTX 2080 Ti one. RTX 2080 Ti, being a newer card do come with some new features and tech that GTX 1080 Ti lacks. However, GTX 1080 Ti is still a gem of a card and is much more affordable than RTX 2080 Ti. So, how these cards stack up against each other? 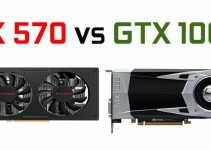 Well here I am going to make a detailed comparison between these two high-end graphics cards, so that you can make a wise decision on which card to get for your gaming needs and which one offers better value for your money. 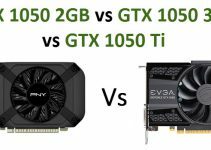 Below you can find detailed comparison between RTX 1080 Ti and GTX 1080 Ti graphics cards based on their specifications, features, performance, power consumption and pricing. Here I am comparing the Founders edition of both these cards which are taken as reference cards. RTX 2080 Ti is a newer card and is built on the Turing GPU architecture which is the most advanced GPU architecture ever built and it supports Real Time Ray Tracing, AI and Deep Learning. The card is built on the 12nm fabrication process and comes with whopping 4352 CUDA cores. In addition to CUDA Cores, the card comes with RT Cores for Ray Tracing and Tensor Cores for AI and Deep Learning. Turing is the successor of Volta GPU architecture and is used in both gaming as well as workstation graphics cards. GTX 1080 Ti, on the other is built on 16nm fabrication process and uses Pascal GPU architecture. The card comes with 3584 CUDA cores and does not have RT cores and Tensor cores. Pascal is the successor of Maxwell GPU architectures and is one of the most successful GPU architectures of all time. Pascal GPU architecture does lack behind Volta and Turing GPU architecture when it comes to advanced stuff like Artificial Intelligence, Deep Learning and also Ray Tracing which only Turing is capable of. You can check out the complete comparison between Pascal, Turing and Volta GPU architecture from the link given below. Both of these graphics cards come with 11GB video memory having bus width of 352-bit. However, they differ in memory type and speed. RTX comes with faster GDDR6 memory having effective clock speed of 14 Gbps and offers bandwidth of 616 GB/s. on the other hand, GTX 1080 Ti comes with GDDR5X memory with clock speed of 11 Gbps and offers bandwidth of 484 GB/s. Yes, RTX 2080 Ti does have higher bandwidth comparatively but I don’t think it is going to make much of difference because that much bandwidth is not going to affect gaming performance. Both these graphics cards support DirectX 12, OpenGL 4.5, Vulkan APU, Nvidia GPU Boost, G-Sync, Nvidia Ansel and SLI Multi-GPU setup. However, RTX 2080 Ti packs more features as it supports Real Time Ray Tracing and Deep Learning Super-Sampling (DLSS) which is an AI powered Anti-aliasing technique done with the help of Tensor cores, and is much faster than other Rasterization Anti-aliasing techniques. RTX 2080 Ti also comes with a USB Type-C port that supports VirtualLink and allows you to connect Virtual Reality (VR) headsets directly to it. It must be noted that to take advantage of Ray Tracing and DLSS, the game must support these features. 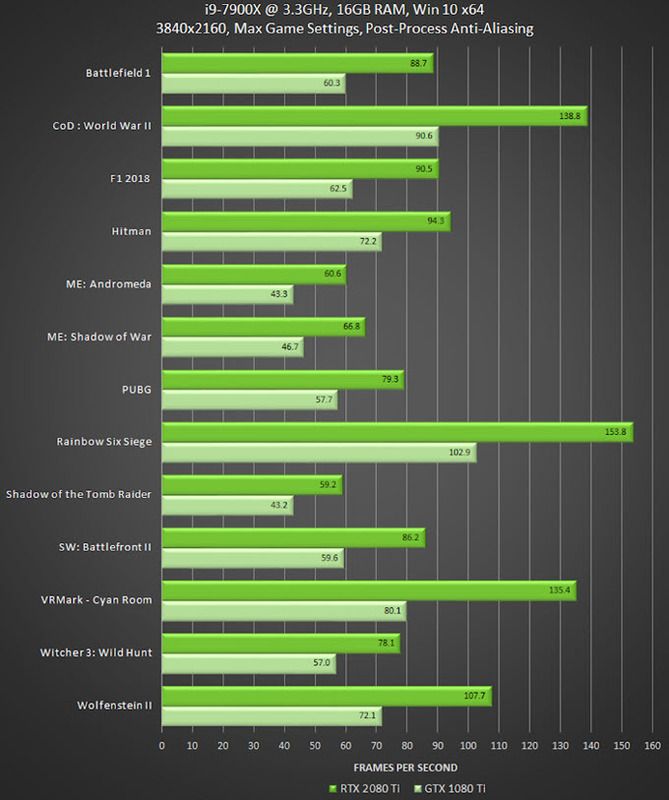 Here are gaming benchmarks of both these graphics cards in latest AAA games at 4K resolution. From the above benchmarks, you can clearly see that RTX 2080 Ti beats GTX 1080 Ti in every game and is on average 25% to 30% faster than GTX 1080 Ti. RTX 2080 Ti is capable of running almost any game at maximum graphics settings at 4K with 60 FPS or higher. Having said that, GTX 1080 Ti also can run most of the modern games at highest graphics settings at 4K with 50 to 60 FPS and higher in some games. So, both of these cards are very much suitable for 4K gaming no matter what game you throw at them. When it comes to power consumption then both these cards are almost equally matched. RTX 2080 consumes 260W of power and requires a 650W SPU for its working, while GTX 1080 Ti has power consumption of 250W and the recommended PSU for it is of 600W. 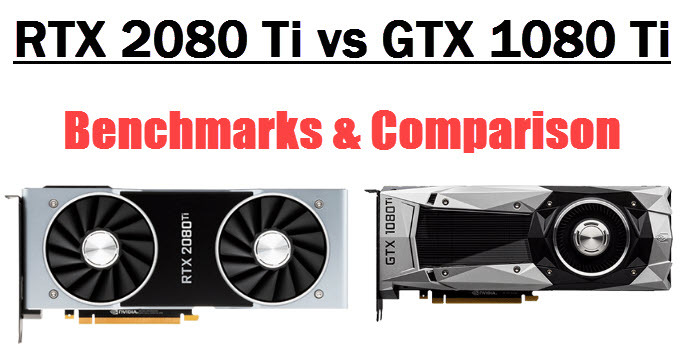 GTX 1080 Ti does beats RTX 2080 Ti by a small margin but overall, they are on the same page and requires a hefty power supply for their working. The Founders edition of RTX 2080 Ti sells at $1199 MSRP while that of GTX 1080 Ti at $799. However, aftermarket edition of RTX 2080 Ti will cost you much higher and right now they are very hard to find because of availability issues. On the other hand, you can easily find an aftermarket GTX 1080 Ti, even under 700 dollars and they are readily available too. The price difference between these two cards is at around 400 to 500 dollars on average which I think is way too much. 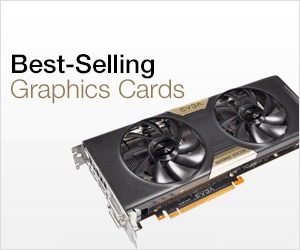 You can check the current prices of both these graphics cards from the links given below. Well, RTX 2080 Ti is no doubt a superior card but you will be paying almost double for it for around 25% to 30% more performance over GTX 1080 Ti. Yes, you will also get new set of technologies like Ray Tracing and DLSS but as of now I don’t see many games supporting it in the future. Also, Ray Tracing is a very taxing feature and when enabled, you can play games at 1080p resolution only with 50 – 60 FPS. 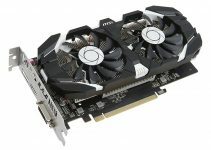 So, I think it is really not worth the price when you are paying such a big amount for card that can only game at 1080p when ray tracing is enabled. GeForce GTX 1080 Ti is still a beast of a card which can run almost all games at 4K easily with comfortable frame rates. It may not support Ray Tracing and DLSS but I don’t think gamers are going to sacrifice performance or resolution for just extra good-looking shadows and lightning. So, in my opinion GTX 1080 Ti is clearly a better deal and makes more sense. However, if you can spend that much money and want the fastest graphics card for gaming with latest technologies then there is no graphics card that can match RTX 2080 Ti.